Known as "The Historical Galley", this combination of rowing and sailing ship is the oldest surviving galley in the world. Used by Turkish sultans for transportation and ceremonies she does not feature any cannons or other military features. Her kiosk, on the stern, is believed to have been build during the reign of Sultan Mehmet III (1595-1603). She has 24 pairs of oars, for 144 oarsman, is nearly 40 meters long, and weighs over 57 tons. She is constructed of nine types of trees: iron oak, cedar, elm, beech, sycamore, ash, boxwood, black pine, and walnut. 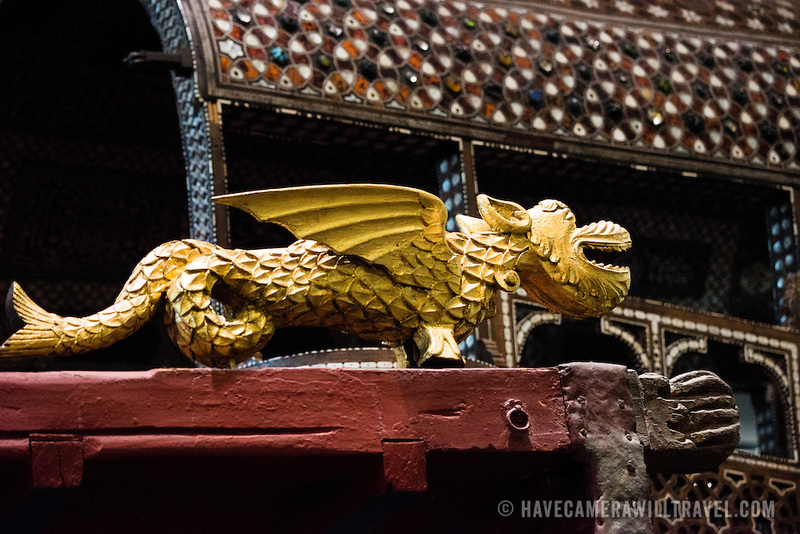 The golden dragons next to the kiosk are symbols of the Byzantine empire. The Istanbul Navy Museum dates back over a century but is now housed in a new purpose-built building on the banks of the Bosphorus. While ostensibly relating to Turkish naval history, the core of its collection consists of 14 imperial caiques, mostly from the 19th century, that are displayed on the main two floors of the museum.